A Students' Federation of India leader was stabbed to death and two others were injured in an attack allegedly by members of a pro-Islamic outfit at a college in Kochi, police said on Monday. They were attacked allegedly by workers of the Campus Front and its parent outfit Popular Front of India inside the Maharaja's College, Ernakulam, campus on Sunday night, they said. The condition of one of the injured students is said to be serious. Three workers of the PFI and the Campus Front have been taken into custody in connection with the incident, police said. The SFI, the student wing of the Communist Party of India-Marxist, has called for a state-wide protest on Monday against the killing of Abhimanyu, 20. 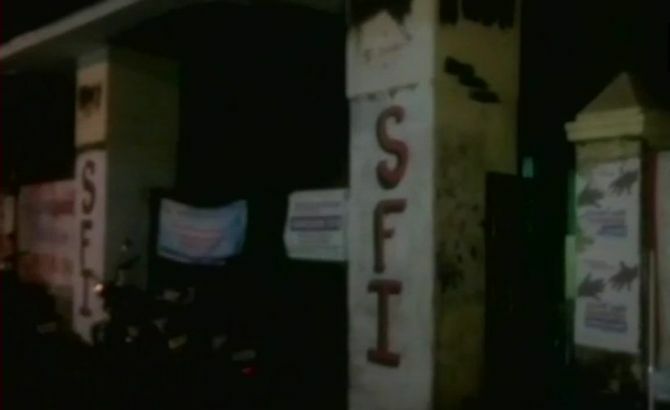 The SFI leader, a second-year degree student at the college, was a resident of Vattavada in Idukki district and also a member of the organisation's Idukki district committee. The body has been kept at the Ernakulam General Hospital's mortuary. Police suspects that issues between student activists over using college walls led to the attack. CPI-M state secretariat member and former Rajya Sabha MP P Rajeev condemned the attack on the SFI workers and described it as a "planned" one carried out by forces with "extremist nature." "We have not heard about such a heinous attack on student activists in recent times. All the progressive forces should come forward to fight against such outfits with extremist nature," said Rajeev, a former state leader of the SFI from Ernakulam district.